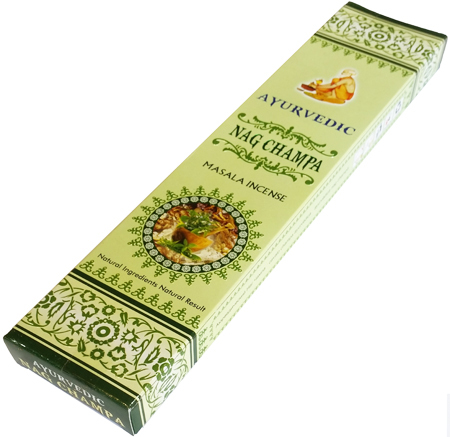 Ayurvedic Premium Nag Champa Incense, are an incense made with only the finest and highly scented unique blend of rare herbs, flowers, honey, resins and pure essential oils. Totally free from any toxic materials or ingredients, and these Ayurvedic incense sticks offers you a lovely refreshing and soothing scent in your meditation, home or office of ten different kinds of fragrances and types to suite everyone, lifting you into the realms of your dreams. Our Ayurvedic incense sticks caress your mind and soul with their flavours right through the day, and make you wish to go back to its presence. This incense touches your senses and will be in the air for a long time with there high quality ingredients, creating a continuous, pure atmosphere. Burning time approx 60 minutes. Each pack contains 12 to 15 sticks. High quality long lasting scents. No child labour or animal by-products.